Taking good jewelry pictures is a necessity. This unexpected skill often trips up artisans. But hopefully I canl help you get going in the shortest amount of time. The webinar is especially designed to cover the basics and explain camera settings in an easily understandable and efficient manner. Do you really need a dSLR? With smartphone camera quality on the up and up, many people are switching to what they already have - their cell phone. This webinar demonstrates how to use smartphones and save a whole lot of money and time. It includes not only how to take great pictures on a smartphone but to watermark and submit to online stores and promote on social media - all without having to go anywhere near a computer! In addition, it is always from the perspective of what a jewelry artisan needs to know and do for selling jewelry online. For example, your photography should reflect your brand. Many examples are given. This will be more convenient for you as you will be able to access it whenever you want and for as many times as you want! "What a great photography webinar. You covered all the bases of creating photography for online viewing, selling or posting for any number of reasons. The App names you provided are excellent for creating those perfect photos without having to go to a computer. I love the idea of keeping it simple. Taking pictures correctly, with very little editing has always been a challenge, so I’m looking forward to following the simple steps you provided to take the stress out of the many steps involved in taking your images to the next level. It’s amazing how much we can do on our phones, although there was much information on using your DSLR camera, too. Anyone with an online presence that uploads images would benefit from your webinar. The price was so extremely reasonable for the information given. "I love it when a class exceeds my expectations. In Pearl’s photography webinar I found a wealth of new ideas along with a great refresher on long-forgotten camera basics. I particularly enjoyed the sections on spot metering, depth of field and exposure value. Another big plus was seeing the Modahaus Tabletop Studio in action. Combined with Pearl’s tips, it’s the ideal way to take great photos of my work. I’m ordering one right away. Many thanks, Pearl!” Sally Bee. "I highly recommend it for anyone who wants to improve the photos they take of their jewelry. She explained so well how to set up the camera settings, what types of focus to use, lighting, backgrounds, etc. The detail was excellent. Pearl is personable and easy to understand. She allows the students to communicate with her and ask questions. It is jam packed with helpful information, and a terrific bargain for your education dollars." LeAllyson M.
"I just took this webinar again with Pearl. I just can't recommend this webinar with Pearl enough.I learned more again the second time around plus Pearl has added to the webinar since her early days. She also answers any questions you might have no matter how trivial (and we all have those questions we are afraid to ask in case we look just plain dumb). Pearl goes through your answers step by step and makes everything so clear and easy to understand. We had the great good fortune to have Lex McColl who developed the Modahaus Tabletop Studio for photography. It was wonderful to listen to him talk about photography and cameras and have him listen to our problems about taking jewelry photographs. He even had incredible patience to wait while we searched for a photograph I had taken of one of my creations that I had a problem with. I learned so much from him as well. Thank you again Lex! And - Thank you Pearl for the amount of work you have put into this webinar. I - always - learn something new each time I take it. I really can't thank you enough for your professionalism and your experiences and your sharing." Aims A. "The webinar was well thought out and comprehensive, providing a wide variety of things that might never occur to a newcomer. As you said, you've been there and done that but how helpful to have that information in the planning stages! The presentation was very professionally done as well." Chardell K.
"First, let me say how much I learned in your jewelry photography webinar! I'm switching to using my iPhone 5s, and have a tripod and camera mount coming soon. I'm playing with the Camera + app, so I'll be putting it all together shortly!" Karen O. "It was well organized and presented. I more fully understand how to photograph my jewelry now and with further experimentation, I am confident I can begin taking the quality of pictures my creations deserve! I gained much needed info from your webinar and am very excited to start applying that knowledge. I am glad I waited and learned how to do it correctly instead of posting poor photographs! Thank you so much for sharing your knowledge and I am addicted to your blog!" Tamera V.
"Pearl, the webinar was amazing! Lots of great information and I am looking forward to playing around with my new iphone 6 as well as getting more familiar with my samsung camera. Thanks so much for all the hard work that obviously went into this webinar!" LeAnne R.
"I thought your presentation was very good and I appreciated getting all the information in one place. I took copious notes and am going to try to get to know the settings better on my Lumix camera and try some of your recommendations." Kay A. "Thank you kindly for your patience and persistence in helping me get access to the webinar. The information and resources you provided were wonderful and I thoroughly enjoyed it." Theresa T.
Looking forward to the next webinar. I am "okay" at taking pro pics of my jewelry but I could definitely use some major lessons and instructions. I would like to know when the next webinar is scheduled. Thank you Pearl. Hi Carol - Please sign up for my separate mailing list (link above) to be notified for the next seminar. I do have space for the July 27 one. So email me asap! Please go to the link shown above and sign up or email me your email address. I cannot do that for you without an email address. HI - I've entered my email address, but no notification of webinar :( Are you planning one soon? Yes, Phyllis. So look out for it! Where do I go to pay for the webinar? I just took this webinar again with Pearl. I just can't recommend this webinar with Pearl enough. I learned more again the second time around plus Pearl has added to the webinar since her early days. She also answers any questions you might have no matter how trivial (and we all have those questions we are afraid to ask in case we look just plain dumb). Pearl goes through your answers step by step and makes everything so clear and easy to understand. And - Thank you Pearl for the amount of work you have put into this webinar. I - always - learn something new each time I take it. I really can't thank you enough for your professionalism and your experiences and your sharing. Thanks so much for your wonderful comments and support! I also took Pearl's webinar this Sunday on October 25. I highly recommend it for anyone who wants to improve the photos they take of their jewelry. She explained so well how to set up the camera settings, what types of focus to use, lighting, backgrounds, etc. The detail was excellent. Pearl is personable and easy to understand. She allows the students to communicate with her and ask questions. It is jam packed with helpful information, and a terrific bargain for your education dollars. I am so pleased you got so much out of the webinar, LeAllyson. I'm eager to get in on your next webinar. And weekday mornings would be great for me. Thanks! That's great! I do have a couple of people who can make it on a weekday. I will see if I can get you all together. It may have to wait until the new year as the season is getting really busy prior to Christmas. Hope the instructions I sent to you via email makes sense! Yes, me too, winner I mean - yaay! What do I need to do?? Looking forward to our "date"! I have now taken Pearl's webinar twice! The first one was AMAZING and the 2nd one was even better! I wanted a refresher course and Pearl delivered! I also must say that the Modahaus photography set up that she recommends has increased my sales 50%!! So if you really want your pictures to shine you really should invest in one or even two! I will definitely be back for another refresher in the future! Thanks again Pearl! I attended this webinar - I have an early Modahaus - one of the smaller ones, and a dslr and have been to a couple of lessons on how to use my camera - in a general sort of a way, not with jewellery specifically. I wasn't sure what exactly I hoped to gain, but I knew that product photography is important as we are expecting people to buy our products without touching and feeling them - therefore they have to look great in photographs. I wanted to learn how to get a clear white background, and how to keep shiny objects looking shiny - in my opinion, silver and pearls are very difficult to photograph. Pearl and Lex gave us some really great tips on this and what sort of lighting to use. I took loads of notes and am having a lot of fun experimenting with my new-found knowledge.We had loads of time to ask questions and before we knew it, two and a half hours had flashed by - time does fly when you're having fun! Thanks for a very interesting evening, with plenty of food for thought. 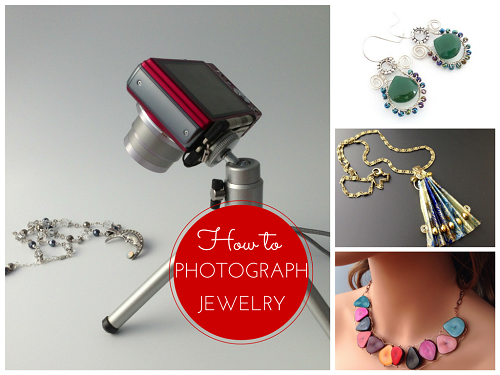 Thank you for sharing the steps and tips for photographing jewelry. This webinar is a must for anyone that wants to improve their jewelry photography skills. I look forward to applying what I learned and attending future webinars. Thanks so much for your kind feedback, Karon! Have fun taking awesome pictures!! How much for the webinar? I am converting this webinar to an online class which is more convenient for everyone. I will let people know when it is ready and how much it will cost.